Can we talk knitting? As an activity it’s rather rhythmic and soothing, easily portable and keeps one’s hands busy when they might be otherwise unoccupied. I particularly like that I can spend an afternoon sitting watching the telly (sports, bad movies, old tv show marathons) and yet still have something productive to show for it. All that said, there is this side to knitting that totally overwhelms me. Most of it has to do with gauge and yarn weights. Sewing, which I’ve been doing since high school, is pretty straight forward. Give me a specific length of fabric and I know exactly what I can get out of that fabric – a skirt, a dress, pajama bottoms, etc. While I mostly sew from patterns, I have been known to draft my own. I have quite the stash of fabric, collected over the years, that I tap into for various projects. When I first learned to knit, I assured my dear husband I would not develop a knitting stash to rival my sewing stash, that I would only purchase yarn on a specific-project-basis. This gave him great comfort, because we knew some knitters that had huge stashes. I’m pretty sure he had this image he would die in a crushing avalanche of books, shoes and yarn at the time (advancing from his previous image of death by avalanche of books and shoes). I have mostly kept that promise, outside of the gifts of yarn from various friends -mostly knitters sharing their stash with me, although there was that one time our friend Eddie stumbled upon two rather large boxes of yarn in the great student move-out one spring that he felt inclined to grab and drop off on my doorstep. Inside those boxes were the most fascinating mix of crap acrylic yarn and some extremely nice natural ones (albeit in some strange colorways). Over time, I’ve purged what I have on hand to what I’ll use in projects. Four balls of one yarn, seven of another – those are enough for projects, yes? I spent most of the holidays sifting through knitting patterns, looking for one that fit the image in my mind of what I wanted to make in the gauge that matched my stockpiled yarn. It was like looking for a needle in a haystack. I spent hours online, I literally plopped down on the floor looking at EVERY knitting book on the shelves at the library, local book shops, etc, in my search for patterns for two very specific projects I had in mind for the yarn I had on hand. I left no stone unturned in my quest. When I knit Pat’s sweater, I followed an Elizabeth Zimmerman pattern from her book, Knitting without Tears. It was based on a formula that included his measurements and the guage of the yarn, knit in one piece from the bottom up, meaning no seams other than the underarms. As I looked around at patterns, I kept wishing there was an Elizabeth Zimmerman one for what I wanted to make, where I just followed a formula, knit from the bottom up in one piece. Turns out, there was such a thing. There was mention of her patterns all over the internet, but after searching high and low for them, I realized I was going to have to order her books if I was going to be able to see them. 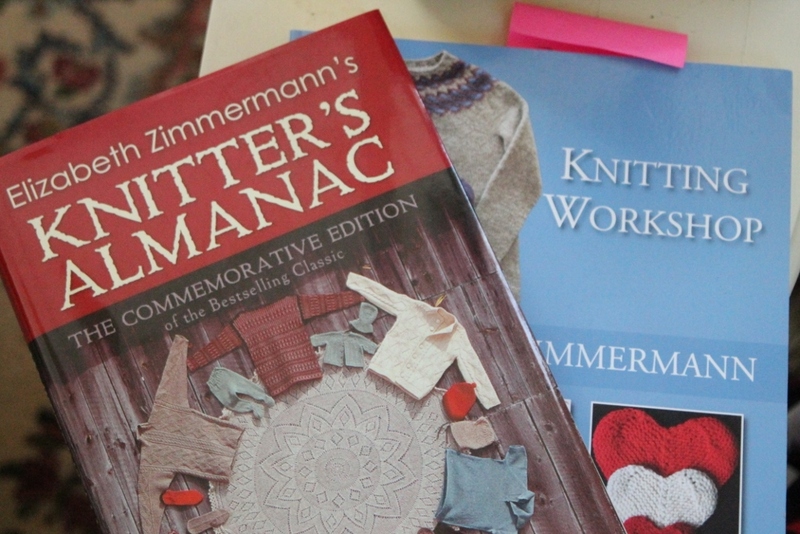 I did not really intend to keep both the books I ordered – Knitting Workshop and Knitter’s Almanac – but as soon as I had them in my hands, I realized, I pretty much needed them both. They are unlike any other knitting book – funny, full of opinions and encouragement for projects I can actually see myself making, most certainly NOT like any other knitting books on my shelves. They are the sort of books where I mark passages not necessarily because it’s a knitting skill, but because it might be a little nugget that speaks to me. That is from the opening of “Knitting Workshop” which takes knitters from beginner to master knitter status. The project I most wanted to knit was in this book, so this book was a keeper from the start. It was “Knitter’s Almanac” that I wasn’t sure about. Laid out with a project for every month, the book also contains chatty, personable commentary on the month’s activities. She talks of sitting ‘snug in our snug yard’ with her husband, but it was the opening of her August chapter that made me realize I needed to keep this book – she talks of writing said book while off in the woods on vacation with her fishing husband and her knitting needles. Clearly, this is a woman who understands me. And she encourages me to just jump in with the yarn I have, if I need to go buy more yarn to finish, well, she has suggestions for that. And so I cast on a project and when I got to the end of the first ball of yarn, realized I didn’t have enough, I went out and got some more. Of course I couldn’t find the same kind, so I had to get creative. I think it’ll turn out okay. 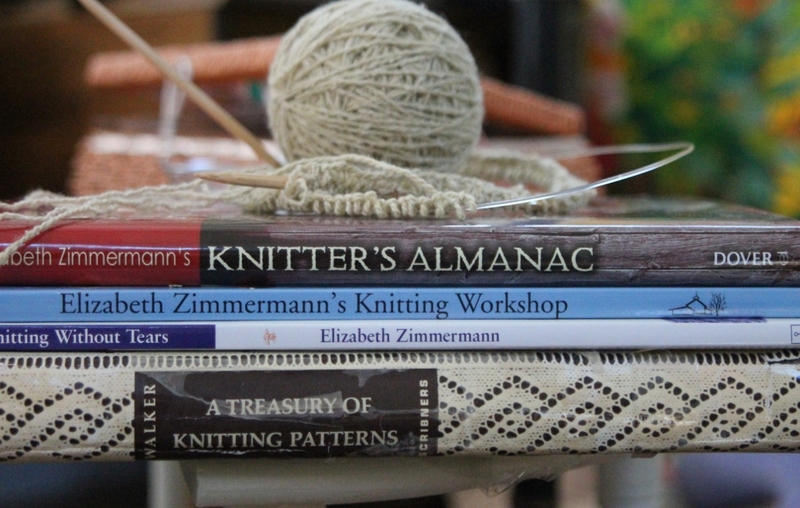 I’m starting to come to the conclusion the only knitting books I need are the Elizabeth Zimmerman ones as well as Barbara Walker’s Treasury of Knitting Patterns – not that I’m getting rid of all my knitting books just yet, but I am ready to cull the shelves. The same thing that intimidates me about knitting is the same thing that fascinates me about it – the seemingly endless creativity contained in a ball of yarn when combined with a pair of knitting needles. In discovering Elizabeth Zimmerman’s approach to knitting, some of the mystery surrounding the habit has been unlocked. I’m so delighted I stumbled upon her. That time I nailed the biscuits. I wish I was patient enough to knit. I’ve never knit more than a scarf. I like crocheting because it’s quick and easy, but I like the look of knit better. I settled for a medium…I crochet and then felt it so it looks like knitting! My yarn stash has never rivaled my fabric stash, at least not anymore. I tend to only buy the amount of wool I will need for a project. Fabric, I always buy extra if I especially love it! Meanwhile, I’m intrigued by some of the looks you can achieve with crochet, but can’t quite get the hang of it! I don’t tend to buy stray yarn, but I can and will buy fabric just because. I know I can always find something to use it for somewhere. Like you, I knit “freestyle.” Sometimes it’s a disaster, but usually it’s good enough. And yes, peaceful, rhythmic and keeps me partially occupied when I require that kind of an activity. I think I’m going to look into that book “Knitting with tears”. I learned to knit as a teen, and at one point I could knit a complex sweater, with yarn changes and designs. Now I have to look it up each time I need to cast on, and I can’t understand any of the shorthand of patterns! But like you, I love the rhythmic feel of knitting. I also crochet, but I prefer the look of knitting. 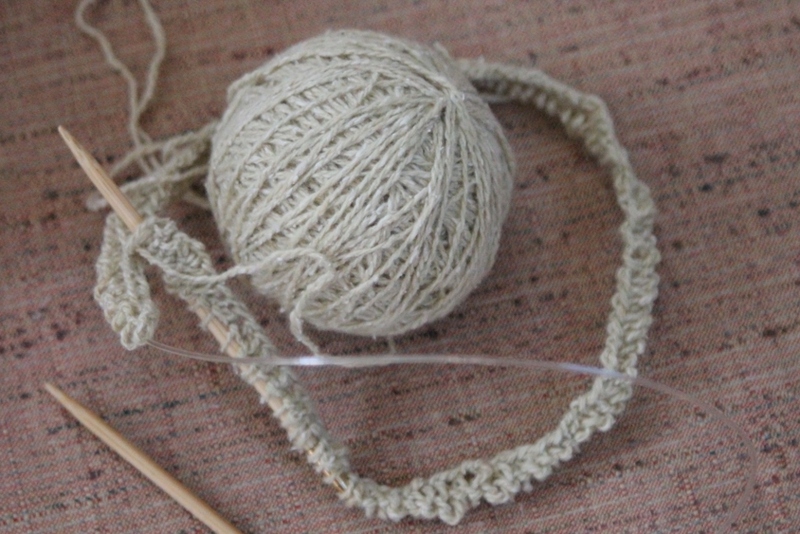 Knitting without Tears is one that I found more easily, but I think I like Knitting Workshop best. I’ve never heard of Elizabeth Zimmerman, but I have definitely shed tears over some of my knitting projects. Yarn weight and gauge get me too–it’s the reason I’ve had to rip the relatively simple wrap I’m knitting three times. I generally need my hand held by someone at the yarn shop when selecting a new project. And as much as I try to knit lace, it escapes me. I’ve got a pair of hand warmers I’ve started several times now that I can’t get right. I do think you’d like her tone as a writer.